July 9, 2015 – On July 11, MSU Denver’s Students for the Exploration and Development of Space (SEDS) chapter will launch a high-powered, two-stage rocket approximately 6,000 feet above ground level. Six additional rockets will be launched as well so that individual students can obtain their National Association of Rocketry Level 1 or 2 High Powered Rocketry Certifications. The launch will be part of the Northern Colorado Rocketry’s High Skies in July event. The main rocket also will serve as the MSU Denver chapter’s first-ever entry into the SEDS University Student Rocketry Challenge, a nationwide competition with a $500 grand prize. The group has already submitted their initial reports on design and manufacturing, and will need to submit a launch report to complete their entry. Winners will be announced at SpaceVision 2015, the SEDS national conference, in November. 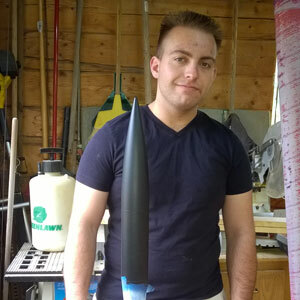 Joseph J. Finkiewicz, an aerospace systems engineering technology student and SEDS president, hopes that a successful launch will create more interest in the club and in science, technology, engineering and math (STEM) careers. Finkiewicz also notes that the student organization is committed to providing hands-on learning opportunities through projects, research and competitions in order establish and grow enthusiasm for space on the Auraria Campus. The 10 a.m. launch is free and open to the public. For more information and directions to the launch site in northern Colorado, visit the SEDS Facebook page.